This week we are going to talk about dental caries, also known as cavities and decay. According to a national study completed by the American Dental Association, approximately 94% of American adults currently have decay or have had decay at some point in their lifetime. Many people know that cavities can lead to the destruction of teeth and that fillings are often necessary when the teeth are decayed. Unfortunately, a lot of the population is clueless about the cause of dental caries, how they can be prevented, and why some teeth need small fillings while others need root canals or crowns. At Pelican Landing Dental, we want our patients to be well-informed about their dental health. One way that we continuously educate our patients is with our blog. We hope that our article today will help you learn some new things about your oral health and, hopefully, motivate you to prevent caries from affecting your teeth and your family’s teeth. If you live in or around the Bonita Springs or Estero communities and are looking for a dentist, please feel free to contact us at any time electronically or call (239)449-6104. To learn more about solutions for your dental caries, please visit the fillings section of our website. Dental caries is what dentists call the tooth decay process that leads to cavities. “Caries” is a Latin word that means “rottenness”. The process of dental decay, or the development of dental caries, is usually a slow process which is driven by bacteria. When you eat sugary foods or drinks, the sugar remains on your teeth for some period of time. Bacteria, which naturally live in all peoples’ mouths, feed on this sugar and collect on the surface of teeth to form plaque. If plaque remains on your teeth for longer than 24 hours, the bacteria in the plaque begin to produce acid. Eventually, this acid causes your tooth structures to dissolve away. The outer layer of the tooth is called enamel and the layer beneath the enamel is called dentin. Small cavities are only in the enamel while larger cavities begin to eat away at the dentin. Eventually, if a cavity gets big enough, it will reach the pulp, or innermost layer, of your tooth. This layer contains the tooth’s nerves and blood supply. When caries reach this layer of the tooth, pain and infection usually occur. It is recommended that your dentist treat dental caries before they reach this innermost area so that you do not develop any pain. Please watch the following video for a visual representation of how caries develop. How Can Dental Caries Be Prevented? 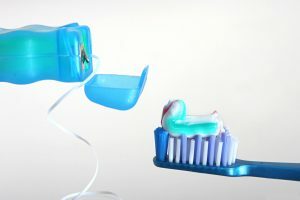 Brush at least twice per day and floss at least once per day: Bacteria can begin to break down teeth after just 24 hours so it is important to rinse away sugars and bacteria often. Many cavities in adults form in between the teeth, where plaque often gets stuck, and the only way to remove this is with dental floss. Regular dental cleanings at least every 6 months: Even most meticulous brushers and flossers are unable to remove all of the plaque that can build up so regular dental cleanings are important to professionally remove all plaque and calculus. Fluoride exposure: Fluoride is present in toothpaste and some drinking water. Your dentist can also apply fluoride in various forms during your dental visit. It is important to talk to your dentist if you are concerned about your fluoride exposure. Diet: It is important to eat a diet low in simple sugars to prevent dental decay. Oral bacteria feed on simple sugars, especially ones found in candies and chewing gums that stick to the teeth. Sealants and fillings: Sealants are used to cover the pits and fissures on molars that, often times, collect plaque and cause cavities. It is also important to have fillings placed while cavities are small in order to halt their progression. Salivary stimulants: Saliva, which is made naturally in the mouth, has a cleansing ability and can help prevent decay. If you have dry mouth, speak with you dentist about ways that your salivary flow can be stimulated. What Are The Various Treatment Options For Dental Caries? There are many different treatment options for decay and these depend on the extent of the decay and the progression of the cavity. Extremely small cavities, also called white spot lesions, can be arrested in their progression with meticulous oral hygiene. If your dentist has to drill away some part of the tooth due to decay, the tooth structure must be replaced with something. Small cavities can be filled with composite resin fillings, which are tooth colored and placed with a dental adhesive. If the decay is large enough, a crown may be required to protect the tooth from fracturing. If the decay is deep enough, a root canal may be needed on the tooth. Finally, if the cavity is so large that there will be little remaining tooth structure after it is cleaned out, your dentist may recommend that this tooth be extracted and replaced with an implant or other prosthesis. We hope that you learned something about cavities and caries by reading our blog entry today. If you have any further questions or if you would like to schedule a consultation, please feel free to contact us at any time electronically or call us (239)449-6104.